Planning a Green Wedding, Throwing a Fabulous Party or Hosting an Eco-Friendly Event? If you are soon to be a bride, are planning a fabulous party or are hosting an eco-friendly event, you will want to take advantage of wholesale pricing on my favorite Made in the USA, natural beeswax, aromatherapy candles from Big Dipper Wax Works. 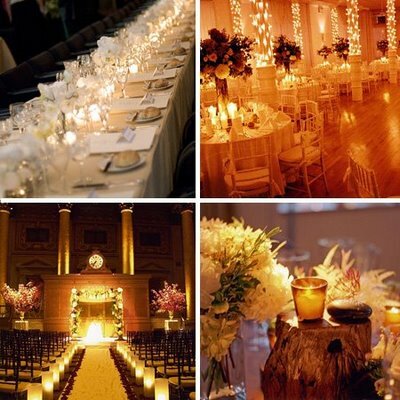 You know how special candles make even an ordinary night at home, but when you use them to set the stage for a romantic wedding or a fabulous party, they really make your event sparkle. 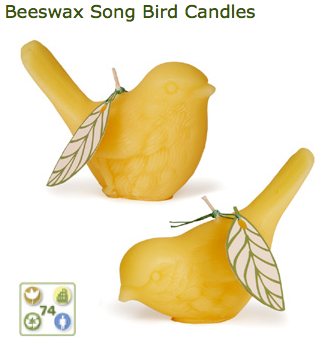 Adorable 100% pure beeswax Song Birds will add charm to any setting. Perfect for a wedding reception, baby shower or a whimsical gift. Hand-casted and molded, they sit 3" tall by 4" wide. Another reason why I love these candles, each candle will burn for over 20 hours. These Big Dipper Wax Works Beeswax candles are my favorite for many reasons but beeswax has been the choice of candle connoisseurs throughout the ages. Beeswax comes from nature and is a renewable resource that actually cleans the air by emitting purifying negative ions. On the other hand, because most candles are made with paraffin, which is a petroleum by-product, to prepare it for candle making it is chemically bleached and hardened, then artificially scented. Burning paraffin emits harmful, black soot and pollutes your indoor air. 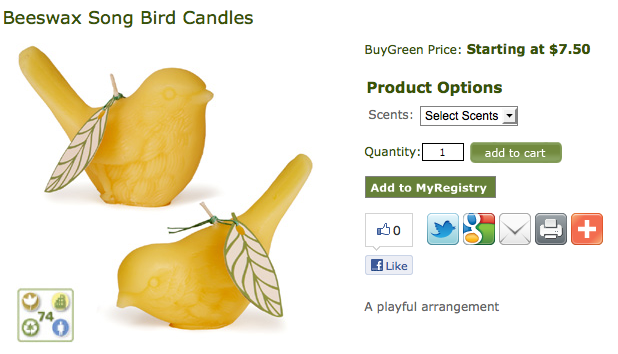 I know I don't have to worry about burning these beeswax candles around my family. These hand poured votives and tea lights are made in small batches using 100% pure beeswax. As always, the wicks are made from 100% cotton and contain no harmful lead or metal. Natural, non-toxic and non-allergenic, these beeswax candles burn long, clean and soot free which is really important for your health. Beeswax is the purest of all waxes and is a product of the sustainable beekeeping industry. There is no need for artificial anything as Beeswax is naturally aromatic and infused with the sweet, subtle scent of honey but they also make aromatherapy candles with essential oils which are a gift to your senses. 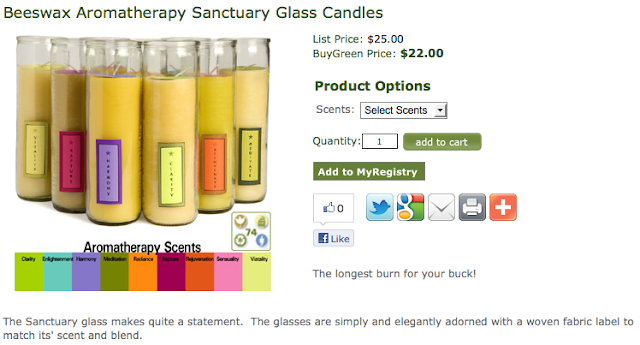 Click HERE for a closer look at the Sanctuary Aromatherapy Glass Candles! With this 18 ounce towering glass candle, you will get the longest burn for your buck. It burns for an amazing 120 hours. A great value. I really love these natural beeswax candles and I'm excited to partner with Buy Green to offer them to you at ridiculously great, wholesale pricing! 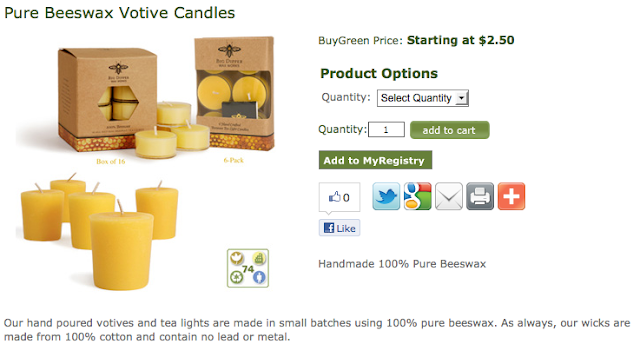 These aromatic, long burning, beeswax candles make perfect gifts for yourself or a friend and for party favors. You can find the perfect candle right here for every one of your parties, holidays and special occasions.